Battaglin Giovanni is a legendary former cyclist and was born on 22nd July 1951 in Marostica (Vicenza, North-East Italy). In 1981, in space of less than two months, he won Vuelta and Giro and was only the second rider after Eddy Merckx to win the Vuelta-Giro double. On the wake of his cycling’s successes and after a violent bike crash, Battaglin decided to start building bikes. In early 1980s he started working with his mechanic in a tiny workshop near his hometown Marostica (Veneto, Italy) and launched his first bicycles. We are offering one of his steel frames from 1990s in a nice Ferrari red colour. 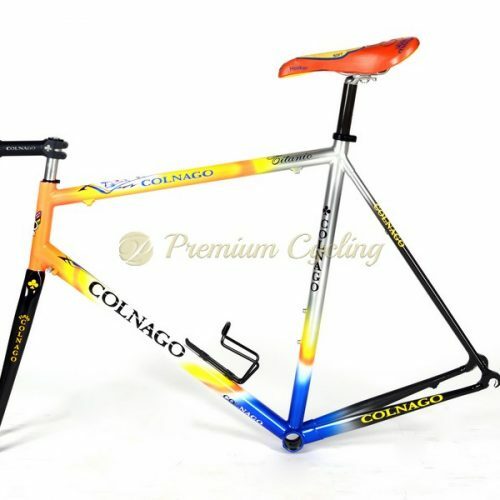 If you would like to build a bike and need a steel frame than this is it. Condition: Used, but in good condition. Frame has no craks, dents and it is not bent. Chromed parts are in good condition. There is one little paint chip under the left chain-stay tube. New Gipieme headset bearing included. * Due to copyright reasons the photos are in lower resolution and marked with watermark. If you are interested, please contact us and we can send a high resolutin photos.